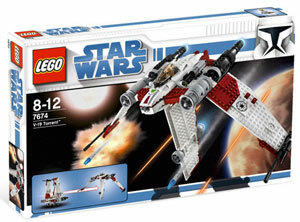 Description Of Item: Battle the Separatist armies in space with the powerful V-19 Torrent starfighter, blasting straight out of the Clone Wars! Wings and landing gear move together automatically to switch between landing and flying modes. Authentically detailed with features including an opening cockpit, flick-firing missiles, and a new clone trooper pilot figure!